One of the great things about having writerly people as friends is the creative living and work arrangements everyone comes up with. Sure, some of us teach, some of us hold regular day jobs, and some of us, including my friend M. works part-time and house-sits full time! I truly aspire to her pared-down existence, if only for the luxe places she sometimes lives in. One of her regular haunts is a historic, fancy-pants house in the Druid Hills area in Atlanta. We’re talking a brick mansion with a 1920s swimming pool out back. There’s a greenhouse, a sauna, a hammock house, a music-listening room, and the world most beautiful kitchen ever. The wife used to run a catering business, so you can imagine the industrial quality ovens, stoves, counters, dishwashers (yes, these are all plural), as well as the spices, pots and pans, knives (I would kill for the contents of her knife drawer), and various cutlery and dishes. It’s swanky and comfortable and oh so much fun to cook in. The other week M. invited me over for a cookbook reading date and a chance to cook in the kitchen. Given the awesomeness of the kitchen, I’ll let you imagine the awesomeness of the cookbook collection. At least 200 volumes. Plus cooking magazines. Plus she cooks a lot of vegetarian fare, so there’s no shortage of amazing vegetarian/vegan cookbooks to browse! One cookbook that I fell in love with is Alice Waters’ Chez Panisse Vegetables. Politics aside, Alice’s recipes are spot-on. They’re simple, but somehow irresistible, complex flavors arise from just a few ingredients. I also love the organization of the book, by vegetable in alphabetical order, which makes everything easy to find. While there are no pictures, something I generally require for a new cookbook purchase, I could almost taste and smell every recipe that I read. While I didn’t make anything from the cookbook right then and there (just a simple Chinese-style stir-fry), I did copy down a few recipes to make later. 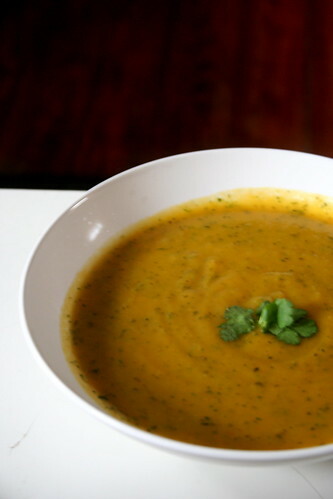 The Carrot & Cilantro Soup is definitely a recipe that embodies everything I noticed in the book: simple ingredients, simple technique, bold flavors. Personally, I hate cilantro. But that’s why I wanted to make the recipe. Maybe I’d like it better mixed into a pureed soup. The smell still gets me though, even though the soup itself tastes fabulous. It’s creamy and sweet with a cilantro freshness–the perfect bridge between winter and spring flavors! I’m not unhappy that I made the recipe, and I’m looking forward to finishing off the leftovers, but the cilantro just isn’t my cup of tea. If you like cilantro, though, please make this! For one, it’s cheap–probably cost $4 to make the whole pot, maybe less, and it’s also just simply delicious. What’s not to love about carrot soup? Peel and slice the onion and put in olive oil to stew. Peel the carrots and potatoes and cut them into large chunks. Once the onions are soft, add carrots and potatoes, salt generously, and continue to stew for approximately 10 minutes. Add vegetable stock, bring to a boil, then lower to a simmer and simmer until the vegetables are cooked and soft. Take the pot off heat. Add the cilantro to the pot. Puree the soup in a food processor in multiple batches until smooth. Strain through a medium sized sieve. Reheat on stove and serve with crusty bread! A cookbook reading date? That sounds totally like something I want to do. Awesome soup. I recently found out how great carrots and cilantro are together. oh man – what a fun time! that’s so cool that your friend gets to house sit! especially in that home! wow! the kitchen sounds especially amazing! ooooooh! i’m not the worlds biggest cilantro fan either. i like a little here & there, but i am working on trying to like it. ahahahaha! i figure that if i just keep putting it in stuff my tastbuds will kinda give in and enjoy it. sounds like i’m gonna have to try this soup! cheap & tasty – i like that! and it’s pretty, too! yay! i love cilantro so i am all over that! Just thinking about that awesome kitchen is inspiring all kinds of jealousy in me! The soup looks creamy and tasty, though I am also not a cilantro fan. That’s a lot of cookbooks!! Oh, the jealousy! ooh…how luxurious! you are so lucky. that soup looks amazing. and the cookbook too. i’m a cilantro lover and it sounds delightful to me! i forgive the cilantro haters though. it may be genetic! i wonder how many other taste preferences are genetic? this sounds and looks just perfect. I have the carrots, now to go and hunt for cilantro. I’ve had this bookmarked for the longest time, and finally decided to make it. I thought it was delicious! I love cilantro, so I put a bit more than half a bunch in. Plus, it’s such a cheap recipe that I’ll probably start making it at least once a week. Question though: do you know if this freezes well? I’d love to have some on hand for when I don’t feel like cooking.